Two young women from South Carolina made it to the awards podium at the 2016 National Archery in Schools Program National Tournament in Louisville, Kentucky. The 2016 National Archery in Schools Program National Tournament featured 12,987 participating student archers at the Kentucky Exposition Center in Louisville May 12-14. Some 245 archers from South Carolina competed, and 20 schools were in attendance at the national tournament. Riverlee Weaver of Socastee, a member of the St. James High School team of Murrells Inlet, was shooting in the ladies high school division. She placed with a score of 297 after a three-way tie shoot-off for first place in the grand event of the bull’s-eye tournament. 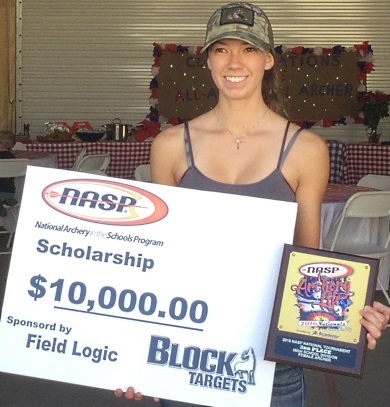 Riverlee placed third in the shoot-off and as one of the top five girls earned a spot in the Scholarship Shoot-Off. This event gives the top five boys and top five girls from the tournament the opportunity to shoot for $77,000 in cash scholarships. In this event Riverlee won a $10,000 scholarship. Riverlee, one of the top shooters in the nation, earned a spot on the All-Star team and will travel in July to South Africa to compete. 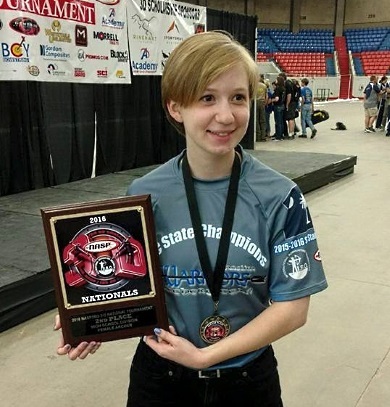 Tabitha Way of Duncan, shooting for the Carolina Warriors homeschool team, placed second in the ladies high school division in the IBO 3-D Challenge, which was also held in Louisville in conjunction with the bull's-eye tournament. "We have a lot of great young archers in South Carolina who take part in our South Carolina National Archery in Schools Program," said Lt. Kim Leverich of the S.C. Department of Natural Resources (DNR), which sponsors the program. Many of the South Carolina archers will compete at the National Archery in Schools Program World Tournament in Myrtle Beach June 24-26. More than 4,000 archers from around the world will compete at the Myrtle Beach Sports Complex for the world title. For more information on the South Carolina National Archery in Schools Program, visit http://www.dnr.sc.gov/education/archery/index.html.